Henry Lewis Stimson (September 21, 1867 – October 20, 1950) was an American statesman, who served as Secretary of War, Governor-General of the Philippines, and Secretary of State. He was a conservative Republican, and a leading lawyer in New York City. He is best known as the civilian Secretary of War during World War II, chosen for his aggressive stance against Nazi Germany, with responsibility for the Army and Air Force. He managed the conscription and training of 12 million soldiers and airmen, the purchase and transportation to battlefields of 30 percent of the nation's industrial output, and the building and decision to use the atomic bomb. After Germany's defeat, he continued to use his skills at the national level to help bring about the Nuremberg Trials. Stimson was the right man at the right time. In addition to skilled military leadership on the field of battle during this war between the free world and the ambitions of tyrants, skilled political leadership was also needed. Franklin D. Roosevelt led the United States with distinction at this time but much of detailed planning of the war and its day by day oversight was the responsibility of the Secretary of War. As a Republican serving in a Democrat administration, he showed his ability to work across party-line at a time of global crisis. Born to a wealthy New York family long involved in Republican politics, he was educated at Phillips Academy in Andover, Massachusetts, where a dormitory is named and dedicated for him, and Yale College (BA 1888), where he was elected to Skull and Bones, a secret society that afforded many contacts for the rest of his life. He graduated from Harvard Law School in 1890, and joined the prestigious Wall Street law firm of Root and Clark in 1891, becoming a partner two years later. Elihu Root, a future secretary of war and secretary of state, became a major influence and role model for Stimson. In 1893, Stimson married Mabel Wellington White, who was the great-great granddaughter of American founding father Roger Sherman and the sister of Elizabeth Selden Rogers; they had no children. In 1906, President Theodore Roosevelt appointed him U.S. Attorney for the Southern District of New York. Here, he made a distinguished record prosecuting antitrust cases. Stimson was defeated as Republican candidate for governor of New York in 1910. Stimson was appointed Secretary of War in 1911, under President William Howard Taft. He continued the reorganization of the Army begun by Elihu Root, improving its efficiency prior to its vast expansion in World War I. Following the outbreak of war, he was a leader in the American effort to aid the stricken people of Belgium. Theodore Roosevelt selected Stimson as one of eighteen officers (others included: Seth Bullock, Frederick Russell Burnham, and John M. Parker) to raise a volunteer infantry division, Roosevelt's World War I volunteers, for service in France in 1917. The U.S. Congress gave Roosevelt the authority to raise up to four divisions similar to the Rough Riders of 1st United States Volunteer Cavalry Regiment and to the British Army 25th (Frontiersmen) Battalion, Royal Fusiliers; however, as Commander-in-chief, President Woodrow Wilson refused to make use of the volunteers and the unit disbanded. Stimson went on to serve the regular U.S. Army in France as an artillery officer, reaching the rank of Colonel in August 1918. 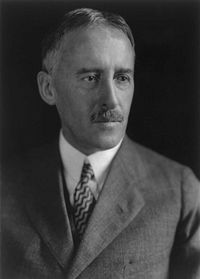 From 1930 to 1931, Stimson was the Chairman of the U.S. delegation to the London Naval Conference. In the following year, he was the Chairman of the U.S. delegation to the Geneva Disarmament Conference. That same year, the United States issued the "Stimson Doctrine" as a result of the Japanese Invasion of Manchuria: The United States refused to recognize any situation or treaty that limited U.S. treaty rights or was brought about by aggression. Returning to private life at the end of Hoover's administration, Stimson was an outspoken advocate of strong opposition to Japanese aggression. In 1940, President Franklin D. Roosevelt returned him to his old post at the head of the War Department, and he skillfully directed the rapid, tremendous expansion of the Army to a force of over 10,000,000 soldiers. Ten days before the Attack on Pearl Harbor, he entered in his diary the famous and much-argued statement—that he had met with President Roosevelt to discuss the evidence of impending hostilities with Japan, and the question was "how we should maneuver them [the Japanese] into the position of firing the first shot without allowing too much danger to ourselves." Stimson was the major decision-maker on the atomic bomb, with direct supervision over General Leslie Groves, head of the Manhattan Project. Both Roosevelt and Harry S. Truman followed his advice on every aspect of the bomb, and Stimson overruled the military when needed (for example, by taking the cultural center Kyoto off the target list). On August 6, 1945, the first atomic bombing destroyed Hiroshima. Stimson strongly opposed the Morgenthau Plan to de-industrialize and partition Germany into several smaller states. The plan also envisaged the deportation and summary imprisonment of anybody suspected of responsibility for Nazi war crimes. Initially, Roosevelt was sympathetic to this plan, but against Stimson's opposition, and due to the public outcry when the plan was leaked, he backtracked. Stimson thus retained overall control of the U.S. occupation zone in Germany, and the Morgenthau plan never went into effect per se, but did influence the early occupation. Stimson insisted to Roosevelt that ten European countries, including Russia, depended upon Germany's export-import trade and production of raw materials and that it was inconceivable that this "gift of nature," populated by peoples of "energy, vigor, and progressiveness," could be turned into a "ghost territory" or "dust heap." What he most feared, however, was that too low a subsistence-level economy would turn the anger of the German people against the Allies and thereby "obscure the guilt of the Nazis and the viciousness of their doctrines and their acts." Stimson pressed similar arguments on President Harry S. Truman in the spring of 1945. Stimson, a lawyer, insisted (against the initial wishes of both Roosevelt and Churchill) on proper judicial proceedings against leading war criminals. He and the War Department drafted the first proposals for an International Tribunal, which soon received backing from the incoming president Truman. Stimson's plan eventually led to the Nuremberg Trials of 1945-46, which have had a significant impact on the development of International Law. During his career, Stimson held several important posts in the U.S. Government. He was a conservative Republican who made a firm stand against Nazi Germany during World War II. Stimson also managed to effectively run the draft, provide goods and transportation to the soldiers, and oversee the creation of the atomic bomb during the course of the bloody conflict. Stimson is also remembered as a skilled lawyer, who served well at the post in New York and continued to use his skills at the national level to help bring about the Nuremberg Trials following Germany's defeat in the war. The Henry L. Stimson Center in Washington, DC, a private research institute on international relations, is named for Stimson. Prior to his death in 1950, Stimson had been the last surviving member of the Taft Cabinet. ↑ Theodore Roosevelt, The Foes of Our Own Household (New York: George H. Doran company, 1917), 347. ↑ Bruce Cumings, Parallax Visions: Making Sense of American-East Asian Relations (Durham, NC: Duke University, 1999), 47. ↑ U.S. Department of Energy, The Manhattan Project. Retrieved November 7, 2007. ↑ Michael R. Beschloss, The Conquerors: Roosevelt, Truman and the Destruction of Hitler's Germany, 1941-1945 (New York: Simon & Schuster, 2002), 118. ↑ Arnold A. Offner, "Research on American-German Relations: A Critical View," in The Relationship in the Twentieth Century, vol. 2, America and the Germans: An Assessment of a Three-Hundred-Year History, ed. Joseph McVeigh and Frank Trommler (Philadelphia: University of Pennsylvania Press, 1990), 176. ↑ The Henry L. Stimson Center, Stimson, Stimson Retrieved November 7, 2007. Gerber, Larry G. Stimson, Henry Lewis. American National Biography Online. Retrieved November 7, 2007. The Henry L. Stimson Center. Stimson. Retrieved November 7, 2007. Morison, Elting Elmore. Turmoil and Tradition: A Study of the Life and Times of Henry L. Stimson. Boston: Houghton Mifflin, 1960. Roosevelt, Theodore. The Foes of Our Own Household. New York: George H. Doran company, 1917. Stimson, Henry, and McGeorge Bundy. On Active Service in Peace and War. New York: Hippocrene Books,  1971. U.S. Department of Energy. The Manhattan Project Retrieved November 7, 2007. History of "Henry L. Stimson"
This page was last modified on 18 December 2017, at 16:51.